Best Nails in Fort Worth! Offering Gel Nail Art to Luxurious Spa Pedicures, Manicures and More. The Royal Treatment for Both Men and Women. NV Nail Salon & Spa is a progressive Nail Salon & Spa for men and women. At NV Nail Salon & Day Spa you will get the royal treatment. 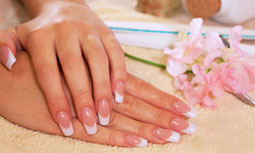 We offer a variety of artificial nail services, nail treatments, nail repairs, acrylic nails, the new Shellac Gel nail. We utilize the best products for all of our services (no toxic products) Tammy Taylor, opi, Shelac, and more. Our clients love the serenity and we have the best nail salon technicians in Fort Worth ready to give your nails a stunning new look in a clean and comfortable setting. Prices are based on the pricing levels of each nail technician. Sit back, relax, and let one of our NV Nail Salon professionals transform your hands, clearing away unwanted cuticles, shaping your nails evenly, massaging and finally polishing or buffing to a nice shine. For a lovely feminine look, consider getting a French manicure at NV Nail Salon. For a flawless manicure, head over to the nail salon and get your nails done. This is a great way to make a statement, or just match an outfit. Go neutrals, or choose from this seasons fun and funky bright colors. Come to NV Nail Salon and let us enhance your beauty. Sit back and enjoy! This is the ideal service if you are looking for a detailed luxurious pedicure. The nail techs at NV Nail Salon will choose the best products to treat your nails and skin type. These are great for the active person. They are applied without removing any of your natural nail and cured in a special UV light. The Shellac is perfect for the client who normally has manicures, and is to busy to come in every week. The gel hardens and protects the natural nail. They will not chip for 14 days. And are easy to remove, without damage to the natural nail. For the look of natural nails, only more durable. These nails will stay polished and looking fresh up to two weeks. They can be made as long or short, as you desire. This is done when your acrylic nails grow out, to keep them looking as fresh as a new set. At NV Nail Salon & Spa we are here to pamper you in Fort Worth’s finest full service hair salon, nail salon & day spa. Complete with exquisite private rooms for massage, facials and separate areas for nail and hair care. A variety of premium services all contained in 5,000 square feet of elegant, yet warm and cozy decor.